Do you love the Dry Bones comic strip? Yaacov Kirschen, its creator, is working on a new project. In a culmination of a lifelong dream, he is designing a Passover haggadah. This haggadah will feature his characters from Dry Bones. How is this project different from all of Kirschen’s other projects? He is getting his funding on Kickstarter, the funding platform for creative projects. The Kickstarter Haggadah campaign will end on November 16, 2012. If you want to have a direct impact on Yaacov Kirschen’s ability to turn out some of his work, this is your opportunity. Sample pages after the jump. Next, we break the middle of the three matzot. Most Jews break the middle matzah into two roughly equal pieces, replacing the smaller piece on the Seder plate and hiding the larger piece as the afikoman. The Republican Haggadah asks the leader (or in Republican parlance, the Seder CEO) to keep 99 percent of the matzah for himself and let the other participants share the remaining 1 percent. 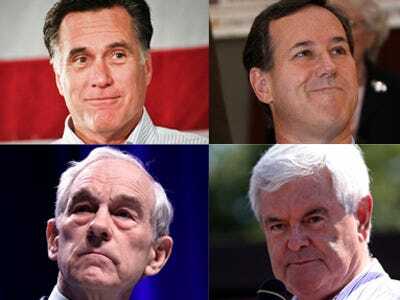 the simple candidate who thinks he’s the wise candidate (Gingrich). They have no wise candidates. President Obama stood with Israel against the Gaza flotilla.